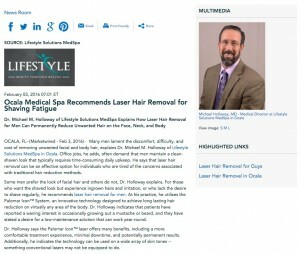 Dr. Michael M. Holloway of Lifestyle Solutions MedSpa explains how laser hair removal for men can permanently reduce unwanted hair on the face, neck, and body. Ocala, FL — Many men lament the discomfort, difficulty, and cost of removing unwanted facial and body hair, explains Dr. Michael M. Holloway of Lifestyle Solutions MedSpa in Ocala. Office jobs, he adds, often demand that men maintain a clean-shaven look that typically requires time-consuming daily upkeep. He says that laser hair removal can be an effective option for individuals who are tired of the concerns associated with traditional hair reduction methods. Some men prefer the look of facial hair and others do not, Dr. Holloway explains. For those who want the shaved look but experience ingrown hairs and irritation, or who lack the desire to shave regularly, he recommends laser hair removal for men. At his practice, he utilizes the Palomar Icon™ System, an innovative technology designed to achieve long lasting hair reduction on virtually any area of the body. Dr. Holloway indicates that patients have reported a waning interest in occasionally growing out a mustache or beard, and they have stated a desire for a low-maintenance solution that can work year-round. Dr. Holloway says the Palomar Icon™ laser offers many benefits, including a more comfortable treatment experience, minimal downtime, and potentially permanent results. Additionally, he indicates the technology can be used on a wide array of skin tones—something conventional lasers may not be equipped to do. Laser hair removal can permanently reduce hair in a targeted area, Dr. Holloway explains, so patients should be sure they no longer want to grow hair in the treated zone. He says men who want greater flexibility can choose to address just the beard if they want to retain the ability to have a mustache. Dr. Holloway adds that the Palomar Icon™ System is designed for both men and women, so everyone should feel comfortable discussing their needs with a qualified laser technician. Led by Dr. Michael M. Holloway and his wife Shannon M. Holloway, Lifestyle Solutions MedSpa offers a comprehensive range of non-surgical treatment options. In addition to aesthetic enhancement procedures, including dermal fillers, chemical peels, and laser hair removal, the practice offers customized weight-loss programs designed and monitored by a bariatric surgeon. Emphasizing small, healthy changes over time, the extensively trained medical team assists individuals in achieving their cosmetic and wellness goals.